When you browse the Internet using any of the browsers, your browsing history and other related data will remain in the system. We all have our own browsing habits. If you are on a public network then your privacy may be lost. So deleting your browsing history is a good practice. But it is not always possible to manually clear all the browsing details when you close the browser. So it would be nice if you have an option to automatically clear all the browsing data when you close the browser. 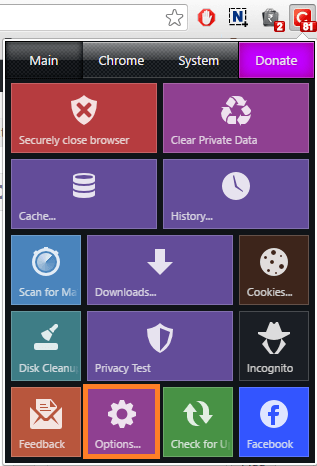 Internet Explorer and Mozilla Firefox has an option to automatically clear your browsing data. But when it comes to Google Chrome you can only clear the cookies automatically. Cleaning the entire browsing data is not possible in Chrome. So after browsing from a system cleaning all the data will help to maintain your privacy. Browsing in incognito mode is an option but automatically deleting all the data related to your browsing is a better approach. The disadvantage of this auto cleaning is that it will delete your account details from every site so that you have to log in every time. Also, the sites will take more time to load while you open them again. In this article, you can read about clearing the browsing history in Google Chrome and Firefox. Google Chrome doesn’t have a feature to automatically clear the browsing history. But you can clear the cookies when you exit Chrome. To do so follow the steps given below. Go to Settings from the menu. You can use chrome://settings/. Go to Privacy section. Under Privacy click on Content settings. 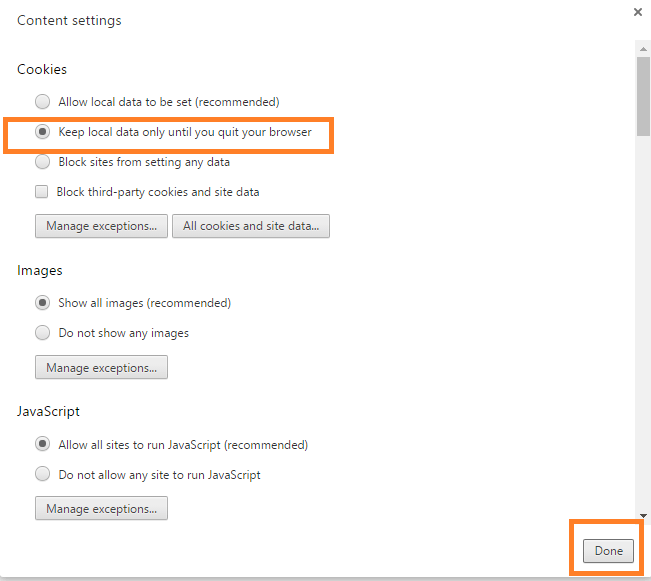 Under Cookies click on Keep local data only until you quit your browser. Then click on Done. The above configuration will clear the cookies when you close Chrome. But browsing history won’t be deleted. To clear all the data you have to add the Click & Clean Chrome Extension. To add the same to Chrome follow the link given below. This free extension allows you to clear the browsing data whenever you exit Chrome. Open the Click & Clean extension by clicking on the ‘C’ icon from the toolbar of the browser. Then click on options. Check the option Delete private data when Chrome closes. 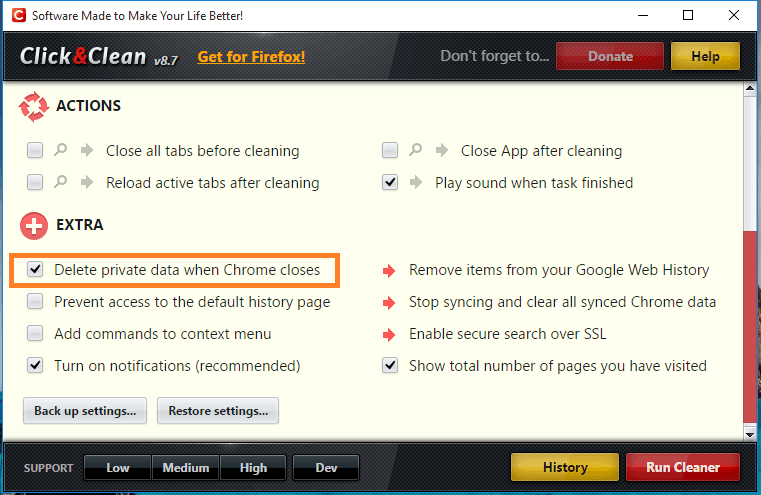 Mozilla Firefox has a default feature to clear browsing data when you close the browser. You can configure Firefox to do so by following the below steps. From the menu go to Options. 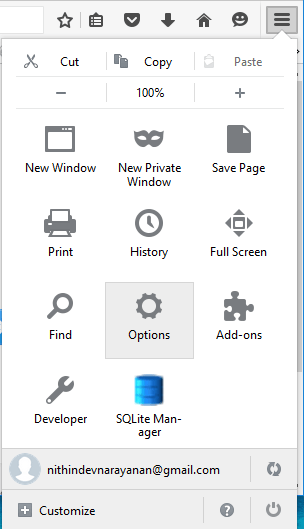 Go to Privacy and under History from the drop down menu select Use custom settings for history. 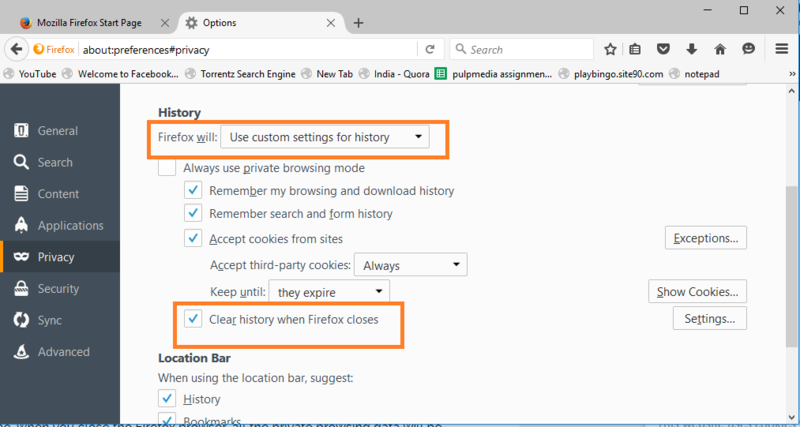 Check the option Clear history when Firefox closes. Clock OK to save settings. Now you have learned how to automatically clear browsing data from Google Chrome and Firefox.